Hereford and Worcester Moths: Lampronia corticella (Raspberry Moth) Local searches bear fruit. Lampronia corticella (Raspberry Moth) Local searches bear fruit. 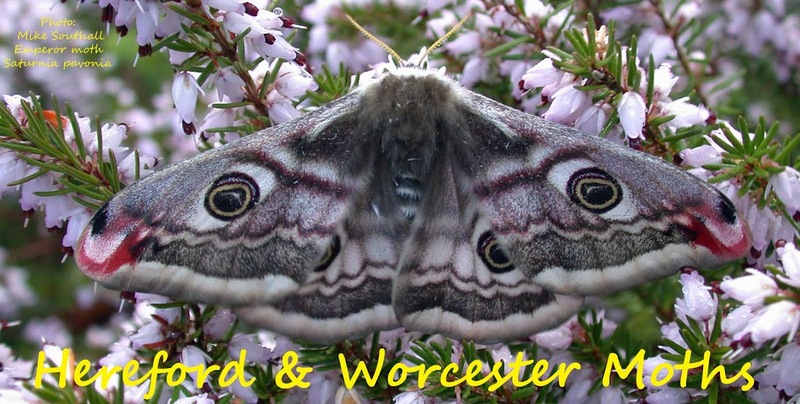 I was keen to photograph this attractive but scarce little moth but the only recent Worcs. records were from Broadway Wood (Oliver Wadsworth), an hours drive for me from Halesowen. 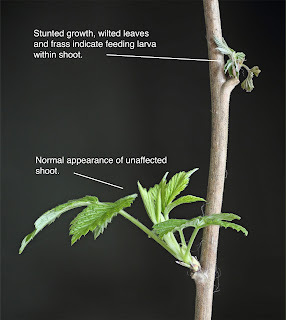 I decided to make the effort and last Saturday travelled down to look for larvae in the stems of raspberry plants hoping to rear pristine, freshly emerged specimens to photograph. 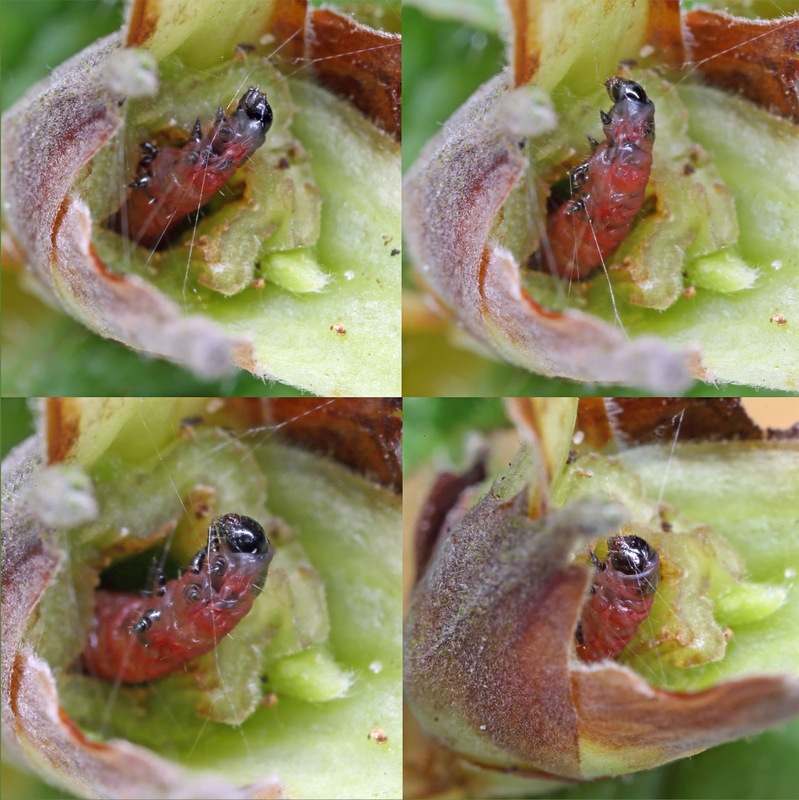 I fairly quickly located one larva plus 3 or 4 stems with feeding signs which are now in containers at home, the larva having spun up beneath a leaf for pupation. A throwaway remark by Steve Whitehouse this morning, "I wonder how widespread this species is?" 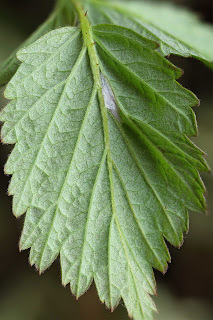 prompted me to visit some raspberry growing on the Clent Hills, close to home, and after 10 mins searching I found a stem with feeding signs in two shoots. Carefully breaking one of the shoots apart revealed the bright red larva of corticella, bingo, a new site. Returning home I remembered there was ample raspberry growing just 300 metres from my back gate, with the moth present not far away at Clent, could it also be even closer to home? You guessed it, yes, 7 wilting shoots with frass indicating feeding larvae, one of which was again removed for confirmation - what a result! Broadway Wood larva spun up for pupation. Clent Hills larva exposed in shoot. Great work Patrick. Good to see this species turning up in other places. I wonder if the Rose feeding Lampronia morosa is around and undetected too. Billy's sighting of an adult in Worcester a few years ago is encouraging. Thanks Oliver, I noticed a good stand of raspberry yesterday on the edge of Hartlebury Common but no sign of feeding there. I'm sure there must be other sites though.